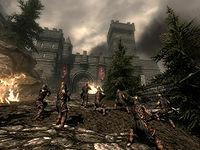 Conquer the Imperial capital and free Skyrim from the Empire! The Stormcloaks mount their final offensive. Get your orders from Galmar Stone-Fist. Go to Solitude and listen to Ulfric Stormcloak's speech. Fight your way to Castle Dour. After taking Fort Hraggstad and returning to Galmar Stone-Fist, you will be told to meet Ulfric Stormcloak and help take Solitude. Make your way to the gates to Solitude to hear Ulfric's speech. After the speech, everyone will run into Solitude. Follow them in and fight your way to Castle Dour. If facing problems coping with the Imperial soldiers, it would be a good idea to stick with Ulfric. There will be several wooden barricades littering the city—three hits or less from a weapon or Destruction spell will break them. The gate to the courtyard will be closed, so you will have to go around the city to get to Castle Dour. Once you've had enough fighting, enter Castle Dour. Galmar and Ulfric will appear inside with you. You will be put in a cutscene mode for a few seconds while Ulfric tells Galmar to secure the door. Head through the doorway with Galmar and Ulfric to confront General Tullius and Legate Rikke. A lengthy dialogue commences, and despite Ulfric's pleas that she surrender, Rikke insists on standing her ground and engages in combat. Kill Rikke and beat Tullius into submission. Once Rikke is dead and Tullius is on the floor, the fighting will stop, and a short conversation will occur. After some talking, Galmar and Ulfric will offer to give you the honor of finishing Tullius, and Ulfric will give you a leveled sword to do the deed with. Choose whether to accept their offer or decline and allow Ulfric to kill the General. This will complete the quest and begin the final stage of the Liberation of Skyrim. This quest, Battle for Whiterun (Stormcloaks), Battle for Whiterun (Imperial), and Battle for Windhelm are all different radiant versions of the same quest. The map marker for Solitude will disappear during the quest, so you will have to fast-travel to Katla's Farm or some other nearby destination and walk from there to the gates of Solitude. To minimize game lag, bodies disappear soon after they have been killed. If you're currently doing the Dark Brotherhood quest Bound Until Death, the Battle for Solitude will be delayed until that quest is complete. Ulfric will stay in his palace, and if spoken to, will tell you, "We're ready to march on Solitude, but the Emperor's cousin is getting married! If royal blood was spilt, all of Cyrodiil would be up in arms. We can't afford an all out war with the Empire. So we'll bide our time for now." If you complete this quest before finishing the main quest, you can encounter Legate Rikke in the mists of Sovngarde. Finishing the quest will clear any bounty currently held by the player in the Haafingar Hold. Contrary to post-quest dialogue indicating that you can raid Imperial Camps to further help the Stormcloaks, the commanders of these camps will still be marked as essential after the quest. After entering Castle Dour, you may get stuck in cutscene mode permanently without Ulfric or Galmar joining you. You can get arrested inside the East Empire Company Warehouse and then serve your time in jail. You can then access Castle Dour and Solitude. ? When you're about to enter Solitude, you may get locked out of the city and say it requires a key to open the door, leaving you unable to finish the quest. Open the console, click on the door, and type unlock. The door will be unlocked and you can continue with the quest. Rikke and Tullius may leave combat mode. It is possible to carry on a conversation with General Tullius about how the war is going while Ulfric is standing right next to him with his axe drawn. It becomes impossible to end the quest. Rikke may become invincible; attacking her until she has zero health will force her to the ground, but she will simply stand up moments later and recover full health. She is not always hostile upon standing up; it may be possible to hold a normal conversation without quest-specific dialogue. General Tullius may also become invincible, as the scripted conversation that results in his death may not be triggered by beating him to the ground. Although the "Talk to General Tullius" dialogue option may still appear, the option cannot be activated, and the quest cannot be completed as a result. Striking Tullius with the Unrelenting Force shout may fix this. Tullius may be paralyzed accidentally when fighting is first initiated. He will fall to the ground as if dead, but proceed to talk and blink until Rikke is killed and Ulfric gives you the honor of killing him. Though he appears dead and cannot move, the slightest damage will kill him, allowing the quest to continue. Additionally, you may find yourself permanently locked in the room with Rikke, Tullius, Galmar, and Ulfric, unable to leave as the only exit door requires a key that you don't have (and can't get anywhere within the room). The only option is reload an earlier save. ? If you have a bounty in Haafingar and are caught by a guard prior to arrival at Solitude, you can submit to paying a fine and find yourself just outside Castle Dour, effectively skipping the entire battle. When you enter Solitude the city may be in its normal state with citizens and city guards wandering around instead of Imperial soldiers. This will cause guards to attack Ulfric, Galmar, and you if you attack guards in Castle Dour along with the essential Legate. The quest can still be finished if you attack Ulfric. However, there will be no speech or cutscenes, and it is recommended that you leave the city soon after. Your bounty will not be reset until you fast travel somewhere else and then back to Solitude. ? If you enter Solitude for the first time for this quest, you will find Jaree-Ra casually standing around while the battle rages around him, waiting for you to speak to him so that he can start his related quest. He is essential at this point, so he cannot be killed, but speaking to him will prevent you from defending yourself until you exit conversation with him. ? If you have never visited Solitude prior to the battle, it can break this quest. If you have completed the quest Destroy the Dark Brotherhood!, then once you have liberated Haafingar, Ulfric will respond, "We're ready to march on Solitude, but the Emperor's cousin is getting married." and the questline will not advance. ? After killing General Tulius and Ulfric's second speech, Solitude may stay in war mode. An easy solution is to fast travel to Windhelm and talk to Ulfric in the Palace of the Kings, where he will offer you to be Thane of Eastmarch. This should reset Solitude back to normal, with Stormcloak soldiers instead of Haafingar guards. 9000 Finishes quest We have captured Solitude, killed General Tullius, and destroyed the final bastion of Imperial influence in Skyrim. This page was last modified on 22 March 2019, at 03:35.